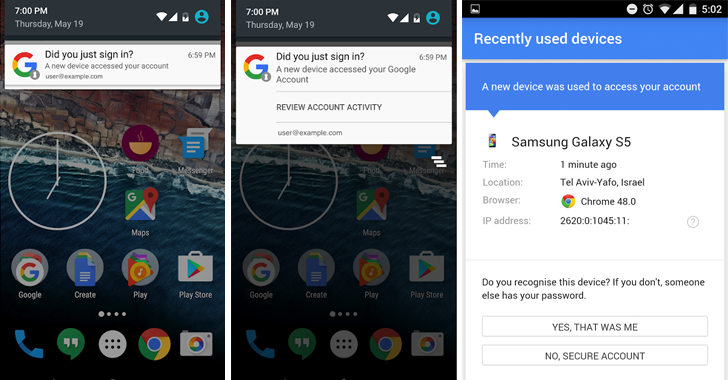 Google has rolled out a new feature for Android users to keep its users account more secure: Native Android Push Notification when a new device accesses your Google account. Google has already been offering email notification for newly added devices, but since people usually ignore emails, the tech giant will now send a push notification to your device screen, giving you a chance to change your password immediately before an intruder gets in. Although it's a little change, the company believes people pay four times more attention on push notifications on their devices compared to email notification. The new feature "increases transparency to the user of what actions they've performed and allows them to flag any suspicious activity they may be seeing on the device," the company says in its official blog post. "Did you just sign in?" If yes, you can just ignore the notification. But if the activity appears suspicious, you just have to tap the "Review account activity" button to know about the details of the new device. You can immediately change your password and add two-factor authorization (2FA) if you are worried someone else has accessed your account. The new feature is rolling out to users gradually, and it may take over two weeks to reach all the users across the world. Recently, Google is taking several measures to secure its users' account privacy. Google also introduced "Google Prompt" that makes 2-Step Verification (2FV) process much easier for you, allowing you to log in with just a single tap instead of typing codes.